Bob Woodward is an investigative journalist whom I have admired for a number of years, his book on the inner workings of the CIA under the Reagan administration I found particularly fascinating. 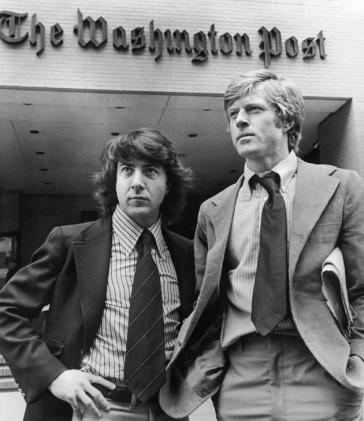 His part in uncovering the Watergate scandal is well documented and especially so in the excellent 1976 film version of his and Carl Bernstein’s book starring Robert Redford and Dustin Hoffman which I watched last night. Redford had the instinct to buy the film rights from the authors for $450,000 in 1974 before watching it gross $70 million at the box office. Yet as financially lucrative as it was, its place in Hollywood and reportage history cannot be over-valued. Woodward and Bernstein’s dogged investigation into the Watergate burglary brought about the resignation of President Nixon and uncovered a web of deceit and conspiracy which sent shock waves across the world. Their work and subsequent book deserved a film which would do it justice. Redford delivered that movie. In what would become a regular on lists of all-time favourite and/or important movies the United States Library of Congress voted for its preservation in the National Film Registry on the grounds of its ‘significance historically, culturally or aesthetically.’ It’s subject matter has shown to transcend time and be as relative today as it was more than forty years ago. If ever a film delivered a masterclass in investigative journalism then this must surely be it, today’s aspiring journalists should see how such a coup was delivered without today’s technology, this was cleverly and hard-gained information collecting of the highest order and the risks to both the journalists and the Washington Post whom they worked for were enormous. The acting is first class, the story strikes at the heart of power and associated corruption and if, like me, it’s been decades since you last saw it then pick up a copy and remind yourself of the disgrace that was Watergate and wonder how many other such scandals have slipped the net.